Unity comes from God's Spirit as we follow Jesus. But, unity has a purpose much deeper than our getting along with each other. Jesus prayed we would be one so that the world would know that God sent Jesus into the world as his Son (John 17). We want to be united so that our praise can bring glory to God. Unity is far more than a goal. Unity is a process through which the world learns of Jesus. At the same time, we glorify the Father who sent Jesus to save us. Leading others to Jesus and glorifying God are what living for Jesus is all about! Let's make unity our passion! 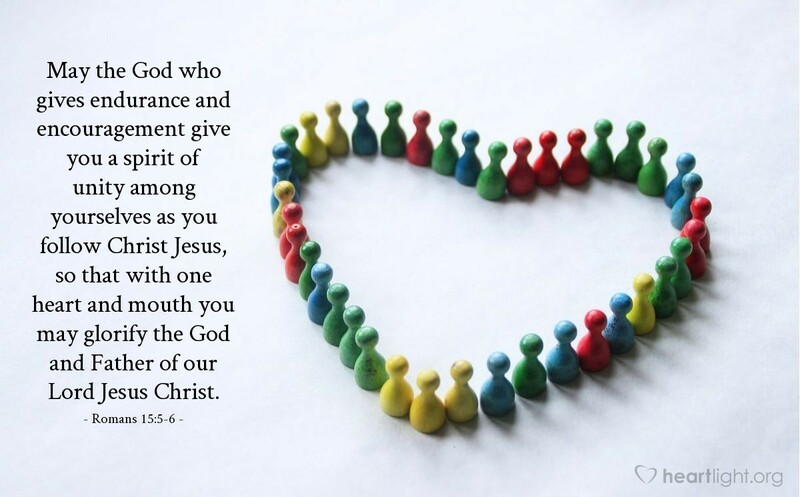 Great and Almighty God, Eternal Strength for all who call on your name, I apologize and ask your forgiveness for everything I've done and every word I've spoken that have hurt others in your family and brought a wound to the unity of your Church. Please bless my efforts as I seek less of my will, seek to live for your glory, and seek to encourage others. In the name of Jesus I pray. Amen.